The early death of rapper Mac Miller at the age of 26 was shocking but not really surprising. His friends, like Bow Wow, were aware of his addictions and how much they had taken over his life. Like many people with substance abuse problems, Miller had anxiety, depression, and other mental-health disorders that created a challenging environment for recovery. In this way, Miller eerily mirrors the deaths of Linkin Park singer Chester Bennington and rapper Lil Peep. Both were very successful musicians who experimented with drugs and who experienced trauma and even PTSD in their lives. Unfortunately, their addictions to various substances overcame their trips to rehab and dual-diagnosis treatment centers and took their lives. And while it is too late to safe Mac Miller, his fans or others who are experimenting with substances like benzodiazepines and opioids can learn a lesson from his death. There is no safe way to take drugs because dependency can strike anyone at any time and pull them into a cycle of permanent abuse and addiction. Thankfully, dual-diagnosis can help individuals get the treatment and recovery they need. Addiction is a problem that often starts early for many people. This scenario was undoubtedly the case for the troubled Mac Miller. When he was just 15 years old, he started abusing Lean or purple drink. This drug is created with over-the-counter products and is often abused by young teenagers who can’t get access to alcohol. Miller started using it after he found himself gaining weight. He is quoted as saying “I was just getting super fat, and I didn’t wanna be on national TV and fat,” which is the reason he started drinking this drug. Being on national TV was a reality for the young man, and he wanted to look as great as possible. As a result, he started drinking Lean regularly, and while it is nowhere near as dangerous as heroin, opiates, or methamphetamine, it was an early beginning to self-destructive behaviors. 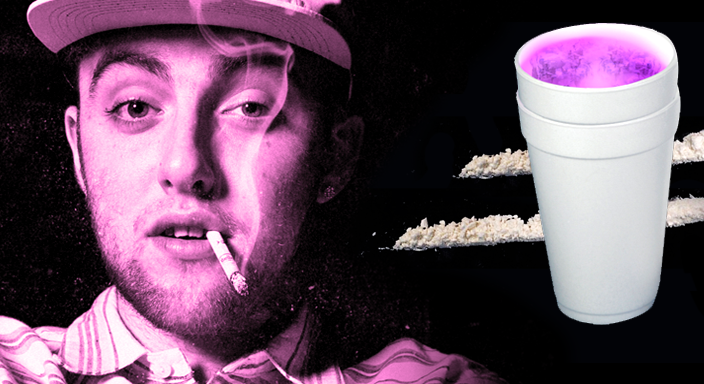 Eventually, he stopped when he finally learned that a friend of his suffered from a stroke due to addiction to Lean. Even worse, other friends of his also died from drinking Lean, a problem that he wanted to avoid, particularly as his career was just starting to rise. Unfortunately, this early introduction to drugs warped his perception of them and compelled him to continue experimenting. Miller was known to say that drugs were dangerous but that they were also “awesome.” His idea was that it was okay to do drugs occasionally to feel the extreme high that they generate. This mistaken belief is commonly shared with many people in his generation. Or, in fact, in just about every age group. Most people who end up addicted to drugs started using under the belief that they could quit whenever they wanted. So when Miller quit doing Lean and started doing harder drugs, he likely felt justified in this belief. Unfortunately, he believed that people with addictions to Xanax and prescription pills were people who couldn’t control themselves. And while he was right in a way, he was wrong in thinking that willpower had anything to do with addiction or quitting drugs. And it is a problem that came back to hurt him as his career progressed and he continued using various substances. One tragic result of his addiction is that his drug use has often inspired his fans to experiment with substances or to believe that they, like Miller thought he was doing, could control their drug use. The issue here should be obvious. Few people can handle their addiction once it takes control of their lives. And Miller was no different. Unfortunately, he did not see it that way. After the release of his 2012 album “Blue Slide Park,” Mac Miller went through many different interviews. During these discussions, he was very open and honest about his drug use. In fact, references to drug use were prevalent all over the lyrics of his album and even in the sound of the production. Unfortunately, Miller was under the impression that he was in no danger from his drug abuse. For example, he admitted to Rolling Stone magazine that he used substantial amounts of cocaine and promethazine. When asked if he was addicted, Miller was defensive. He stated that he was not a drug addict and that drug use did not make somebody an addict. That last fact may be technically correct but ignores the problematic nature of his drug use. In the same interview, Miller stated that he had previously been addicted to drugs and that he had problems with them in the past. However, he claimed that his head was clearer and that his mental health issues were managed correctly. In his eyes, his drug use was okay because he had it under control and wasn’t an addict. In fact, he was working out every day and back into the swing of being a major pop and rap star. That mentality is what is known as a functional addiction paired with severe self-denial. Miller could function after taking drugs and not only record an album but promote it. And as he used drugs to fuel his workouts, he likely felt that their use was justified. Functional dependency may feel better than somebody who is entirely out of control with their drug use but is still a type of addiction that must be treated. And the simple fact is that Mac Miller was in a severe case of self-denial. Many people who suffer from addiction believe that it isn’t hard to quit taking substances and that they can take control of their lives at any time. Often, they are blunt about their drug use but claim that it is occasional or that they are not an addict because…well, they usually don’t have any reasonable explanation for why they aren’t addicted. That said, success is often held up as a prop to explain why their drug use is not a problem. “How can I be an addict,” they might ask, “if my career is so successful?” In many instances, they might even tie their success to their abuse of substances. This scenario has played out with endless musicians, artists, and writers and is tragic every time it takes a life. With Miller, the situation got even worse when his life took a nasty turn. People with addictions who suffer from emotional problems often turn to drugs to manage their emotional discomfort. Mac Miller was no different. After two years of dating, Ariana Grande left Miller for another man. This heartbreak caused Miller to turn to drugs at an even higher level, and he was arrested for a DUI after the breakup. Miller had crashed his car and fled after barely surviving. During his arrest, his blood-alcohol level was more than twice the legal limit. His fans were quick to point to Grande as a villain, believing that she had betrayed him by breaking up and leaving him for another man. This warped perspective is one that fans often have when their favorite artists make a mistake. They shift blame to ensure that their idol is not at fault. And often, the person they are defending takes on the same stance, as Miller did after the crash. Many of these accusations against Grande were levied on Twitter and were posted directly to Grande’s account. Grande, who is known as an avid Twitter user, immediately responded to these accusations. She stated that she was in no way a “babysitter or mother” to Miller. Then, she went on to say that no woman should be blamed for the actions of a partner or an ex-partner, as this was merely a sexist excuse that tried to paint the woman as the monster in every scenario. And while she did express concern for him and hoped that he would regain his balance and sobriety, she also stated that their relationship was very toxic before the breakup. His drug use and continued mental-health issues were difficult for her to manage, particularly as she tried to support her own musical career. And while she still loved him as a person, it was impossible for her to stay with him. Her anger with his fans was very obvious as the press interviewed her after the event. “How absurd that you minimize female self-respect and self-worth by saying someone should stay in a toxic relationship because he wrote an album about them,” was her harsh, but honest, appraisal of that kind of public shaming. Unfortunately, Miller’s drug use only increased in the following days and, in the eyes of his fans, only increased their anger towards Grande. That kind of misplaced anger is understandable after the loss of somebody you love. You want to honor their memory and find somebody else to blame. Let’s make this 100 percent clear: Ariana Grande is not to blame for Mac Miller’s death or even his car crash. She merely wanted to improve her life by leaving a bad relationship. In fact, we’ll even say that Miller cannot honestly be blamed for the tragic turns that affected his life. Addiction has a nasty way of turning the screw and taking control of a person’s actions and forcing them to act in ways they wouldn’t normally behave. Tragically, a little help in a dual-diagnosis center may have helped him immeasurably. Cases like Miller’s are often a result of severe mental health disorders taking control of a person’s life. Addiction and mental imbalance usually go hand-in-hand and fuel each other. This situation is known as co-occurring disorders and is something that affects millions of people every year. Essentially, mental unbalance causes a person to turn to drugs. The temporary calm that the drug provides compels that person to continue using. And as they continue to use, their mental health degrades. As a result, these individuals fall into a cycle of abuse that can feel impossible to escape. Miller never did leave this state but you can with the help of dual-diagnosis. This treatment method provides you with detoxification and help for your mental health disorders at the same time. The idea is to get to the root of the problem and eliminate it for good. In this way, you can better understand the reasons that you use and use better coping mechanisms to overcome your addiction. Thousands of people emerge from this type of treatment every year sober and clean. And with the help of regular psychologist visits, they continue to stay off of drugs for the rest of their lives. While it won’t be simple, you can beat co-occurring disorders for good. So if you or somebody you love is suffering from the kind of addiction that took Mac Miller’s life, you should contact us right away. We are a professional dual-diagnosis treatment facility and have years of experience helping people like you beat an addiction to substances as diverse as heroin, cocaine, alcohol, and benzos. We are staffed with caring individuals who will provide you with a healing treatment and recovery environment. Contact us today to learn more about our treatment methods or to just talk with one of our counselors. They can advise you on the recovery method that is right for your needs. Rehab comes in many different varieties and includes dual-diagnosis, inpatient treatment, outpatient care, group treatment, and even adventure therapy in an exciting environment. These recovery methods are all part of the rehab experience and provide a comprehensive and effective way to beat your dependency and regain a sober lifestyle. Don’t make the mistake that Mac Miller and thousands of others have made before you. There is no safe way to use drugs and no healthy level at which to take them. Instead, get the help you need to save your life.